I love barramundi. It is rich in omega-3 fatty acids and has a mild flavor and lovely texture. I think of it as a sustainable, and affordable, Chilean Sea Bass (one of my favorite fishes to eat!). I have been eyeing leeks and fennel and put this recipe together. You can do in the oven too, but I decided to cook it on the grill. Delicious! Preheat grill, or oven, to 350 degrees. Cut sheets of parchment and fold in half—halves should be more than large enough to cover fish fillets. 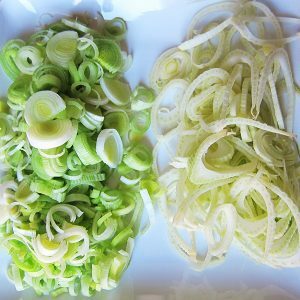 Lay some fennel and leek slices on half of the parchment. Cover with 2 orange slices. Place fish on top of orange slices. Drizzle olive oil over fish and salt and pepper to taste. Place 2 orange slices over fish and add more leek and fennel slices. Repeat on separate parchment squares for each fillet. Fold the other half of the parchment paper over the fish/orange/vegetable stack so that the edges of the parchment line up. Starting at one corner at the fold in the parchment, fold over about 1/2 inch of the edge, pressing down to make a crisp crease. Continue working your way around the edge of the packet, twisting or rolling up the 2 halves of the parchment paper, making overlapping folds (like pleats), always pressing firmly and creasing the edge so the folds hold. Twist the end of the second fold to finish. If necessary, make a second fold anyplace that doesn’t appear tightly sealed. Cut several vent holes in the top with a sharp knife. 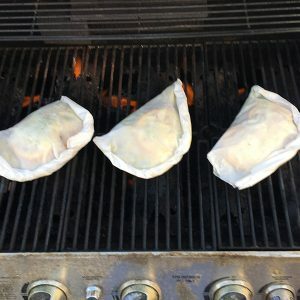 Place the packets on the grill, or on a baking sheet in the oven. Bake for about 20 minutes, or until done, based on the thickness of your fish. Carefully open parchment (the packets release hot steam when opened) and serve. Delicious!